From the creator of the New York Times bestseller The Word Collector comes an empowering story about finding your voice, and using it to make the world a better place. From the creator of the New York Times bestseller The Word Collector and I Am Human comes an empowering story about finding your voice, and using it to make the world a better place. The world needs your voice. If you have a brilliant idea... say something!If you see an injustice... say something! “You don’t have to be loud. Powerful words can be a whisper. You can say something in so many ways. With words, with action, with creativity. ...by just being there for them. SAY SOMETHING with your brush. SAY SOMETHING by planting a seed and watching it bloom. SAY SOMETHING by being brave. When you’re trying to get a kid to do something, it’s often much more effective to simplify your message so that it’s clear and right in his or her face. Otherwise, you risk coming off like the trombone sound used to represent the adults in Peanuts animated specials: WAH WAH WAH. 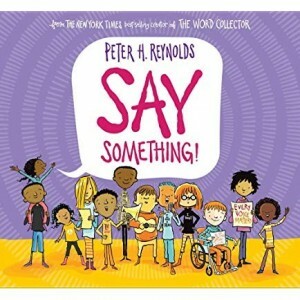 In a picture book dedicated to young hero Emma González, and designed to encourage kids to speak up for what is right, Peter H. Reynolds employs simple messages that will be readily understood by Pre-Ks and early elementary students. I like that Reynolds goes beyond urging kids to speak up when something is wrong. It will be fun for young people to embrace and act upon messages like, “If you want to show the world who you are…SAY SOMETHING with style.” The illustration accompanying this spread shows a girl dressing up in cool, stylish garb. It’s tough being a lone voice. It’s much more effective when you’re part of a chorus for change. This is a fun book for getting the youngest voices to chime in. That’s what I say.